SWEIDA, Syria (AP) — Maysoun Saab’s eyes filled with tears as she recalled finding her parents bleeding to death on the ground outside their home, minutes after they were shot by Islamic State militants on a killing spree across once tranquil villages they infiltrated in a southeastern corner of Syria. Within an hour, she had lost her mother, father, brother and 34 other members of her extended family. Overall, more than 200 people were killed and 30 hostages abducted in the coordinated July 25 attacks across Sweida province. It was one of the biggest single massacres of the Syrian civil war and the worst bloodshed to hit the province since the conflict began in 2011, underscoring the persistent threat posed by the Islamic State group, which has been largely vanquished but retains pockets of territory in southern and eastern Syria. More than two months after the attack, tensions over the missing hostages — all women and children — are boiling over in Sweida, a mountainous area which is a center for the Druze religious minority. Anger is building up, and young men are taking up arms. This week, the militants shot dead one of the women, 25-year-old Tharwat Abu Ammar, triggering protests and a sit-in outside the Sweida governorate building by relatives enraged at the lack of progress in negotiations to free them. It’s a stark change for a usually peaceful province that has managed to stay largely on the sidelines of the seven-year Syrian war, and where most villagers work grazing livestock over the surrounding hills. “We still haven’t really absorbed what happened to us. It’s like a dream or a nightmare that you don’t wake up from,” said Saab, a slender woman with a long braid showing underneath a loose white scarf covering her hair. 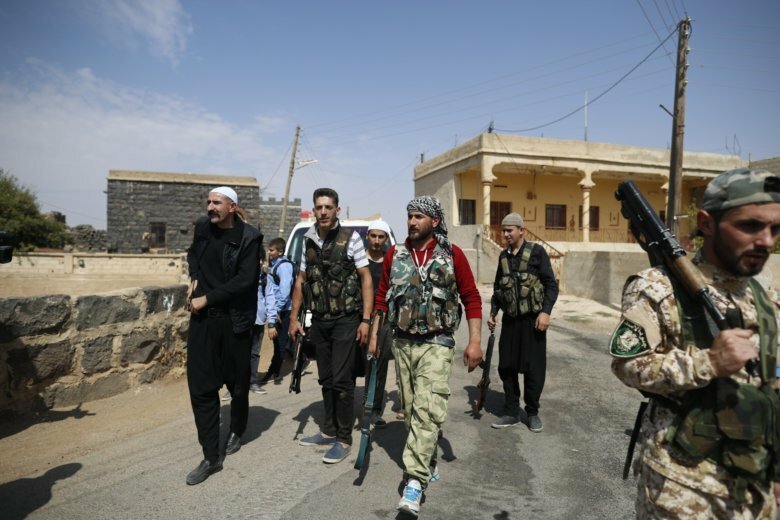 During a rare visit to the Sweida countryside by an Associated Press team, armed young men and teens, some as young as 14, patrolled the streets. Some wore military uniforms, others the traditional black baggy pants and white caps worn by Druze villagers. They said the Syrian army had provided them with weapons to form civilian patrols to defend their towns and villages. Residents recalled a summer day of pure terror that began with gunfire and cries of “Allahu Akbar!” that rang out at 4 a.m. Militants who had slipped into the villages under the cover of darkness knocked on doors, sometimes calling out residents’ names to trick them into opening. Those who did were gunned down. Others were shot in their beds. Women and children were dragged screaming from their homes. Word of the attack spread in the villages of Shbiki, Shreihi and Rami as neighbors called one another to warn of the militant rampage. A series of suicide bombings unfolded simultaneously in the nearby provincial capital of Sweida. In Shreihi, a small agricultural village of cement houses, Maysoun and her husband were asleep in one room, their children, 16-year-old Bayar and 13-year-old Habib, in another when she heard the first burst of gunfire. From her window, she saw the silhouette of her neighbor, Lotfi Saab, and his wife in their house. Then she saw armed men push open the door, point a rifle at them and shoot. Maysoon screamed, her voice reverberating through the open window. The militants threw a grenade in her direction. Her husband climbed onto the roof of their home and aimed a hunting rifle at the men, while she hunkered downstairs with the children. At least two of the men blew themselves up nearby. At the crack of dawn, Maysoun heard another neighbor screaming, “Abu Khaled has been shot!” — referring to Maysoun’s father. Ignoring her husband’s orders to stay indoors, Maysoun ran over the rocky path to her parent’s house, and spotted her father’s bloodied body on the ground near the front porch. She screamed for her mother and found her lying nearby, shot in her leg, blood everywhere. “There is no greater tragedy than to see your parents like this, strewn on the ground before your eyes. We were together just the night before, staying up late together and talking. … They took them away from us,” she said, choking back tears. Maysoun’s brother, Khaled, meanwhile, was trapped with his wife and daughter in their home, fearfully watching the IS fighters from their shuttered window. Another brother, who rushed to their aid, was killed outside Khaled’s home. Less than an hour later, Maysoun called to tell Khaled that both their parents were dead. When he was able to leave his house, Khaled said he and other neighbors fought and killed as many IS militants as they could. He suffered two gunshot wounds in his thigh. But there was no time to grieve. “We didn’t have the chance to cry or feel anything, even if our father, mother, neighbors, friends, all of these people had died. But at the time there wasn’t a moment to cry for anyone,” said the 42-year-old truck driver. Residents said the village men fought with whatever weapons they could lay their hands on — hunting rifles, pistols, even sticks — against the far superior IS guns. The Islamic State group, which once held large swathes of territory in Syria and Iraq, has been mostly vanquished. Its de facto capital of Raqqa, in eastern Syria, fell a year ago this month. But the group fights on in eastern pockets like Deir el-Zour and Sweida province. Some here fear that as the militants flee the advancing Syrian government forces, they will try to regroup in remote pockets of territory like this once quiet corner of Syria. They fear another raid or more trouble because of the brewing tensions over the hostages IS still holds. On Tuesday, a video posted on the internet purported to show IS militants shoot Abu Ammar in the back of her head as they threatened to kill more hostages if the Syrian government and its Russian allies do not meet their demands, which include freeing IS fighters and their family members elsewhere in Syria. In the village of Rami, where 20 civilians from the Maqlad family were killed in the July assault, Nathem Maqlad points to bullet holes and blood stains on the ground from the battle with IS. “I stand ready and alert to defend our land and dignity all over again if I have to,” he said, walking with a group of young men with rifles slung over their shoulders.